On the agenda: good food, some Mallorcan wine, and a different perspective of the beautiful island we call home. We were treating ourselves and The Boss’s sons (visiting for a few days from the UK) to a day trip with Captain Cook, aboard ‘Simmertime’ – a Beneteau Océanis 46. The guys were there for the fun of being on a boat and the promise of a snorkel and swim in a quiet cove. I was there mainly for the food: I’d been told by the owners of Petit Hotel Son Arnau in Selva that Sandra was a great cook. The couple behind Captain Cook is Dutch: Adriaan is the captain, and the aforementioned Sandra, the cook. Experienced sailors, they gave up their day jobs to do something that would enable them to indulge in their love of sailing and the sea. They base themselves in the Balearics during the summer months, offering day trips and longer charters. 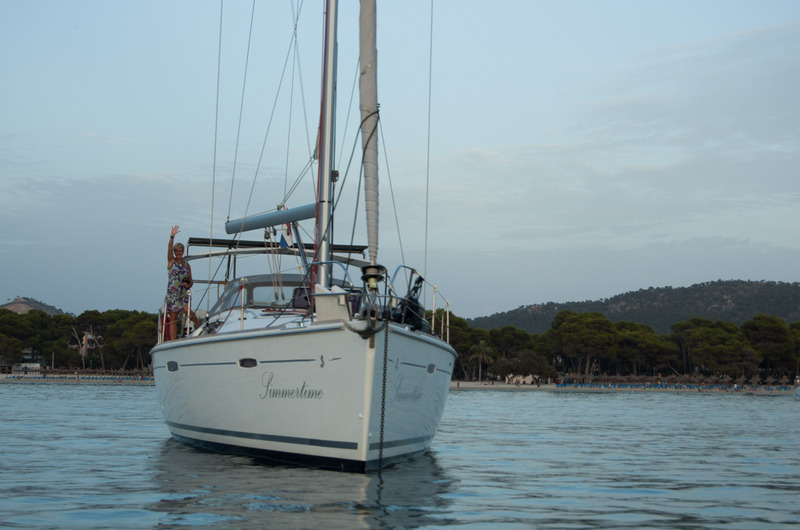 We were sailing from Santa Ponsa, and were collected at the waterside by Adriaan – who whisked us in his Zodiac to the yacht, at anchor in the bay. Within minutes of meeting this couple, we knew we were in for a fun day – starting with a welcome cup of coffee (Nespresso’s Vivalto Lungo), and delicious cake. Then it was time to set sail . . . if there had been a breath of wind. We’d originally planned our trip for the following day, but Sandra had contacted us to tell us it would be stormy for a few days, so we’d brought our trip forward a day. It was definitely a case of the calm before the storm . . .
Undeterred, Adriaan turned on the engines and handed over the controls to me. Yes, me! Even though he knew I was a total landlubber. I bravely took the wheel and navigated my way out of the bay, inadvertently showing an excursion boat captain who really had the right of way. Shortly after, I relinquished control and, for the rest of the day, the guys took turns at the wheel – Adriaan happy to let them indulge their seafaring daydreams, but keeping a watchful eye. We travelled along the coast, passing Peguera, Camp de Mar, Cap des Llamp, Cap de sa Mola, Cala d’Egos, Sant Elm and the island of Sa Dragonera. It was wonderful to gain this new perspective of the island that we know so well when on land. Then we anchored in a pretty cove for a pre-lunch swim and snorkel session (equipment provided) in the deep crystal-clear waters. I’ve often stood and looked out to sea, imagining what it would be like to be having lunch on one of the many boats that drop anchor around Mallorca. Now I know: it’s great. 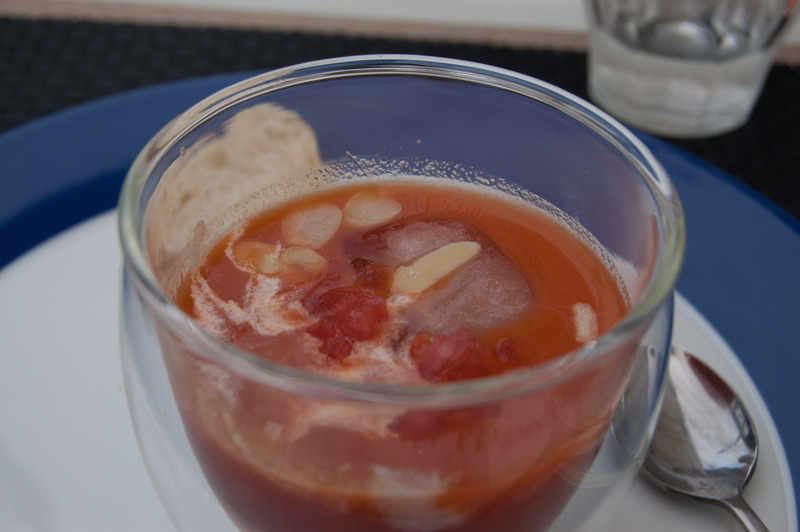 Our lunch on ‘Simmertime’ was four courses and began with a silky refreshing gazpacho, followed by a smoked salmon parcel. 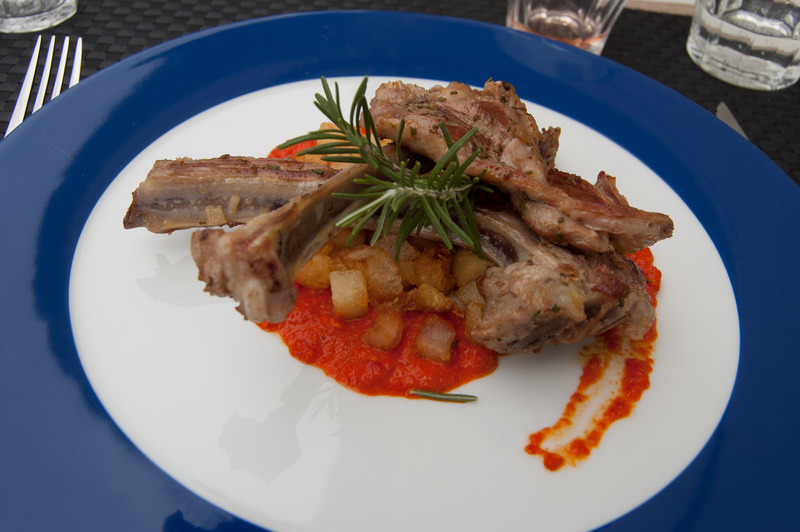 Our main course of lamb cutlets and tiny cubed patatas bravas was particularly delicious; we’d been tantalized by the aromas coming from the galley (see how quickly I picked up the nautical lingo?) and weren’t disappointed when Adriaan presented the plates in front of us. When we’d booked the trip, Sandra had asked about any special dietary requirements; I’d told her that The Boss didn’t eat garlic and she kindly made a garlic-free portion of the sauce just for him. We ended a superb lunch – accompanied by good Mallorcan wines – with a fresh fruit plate. 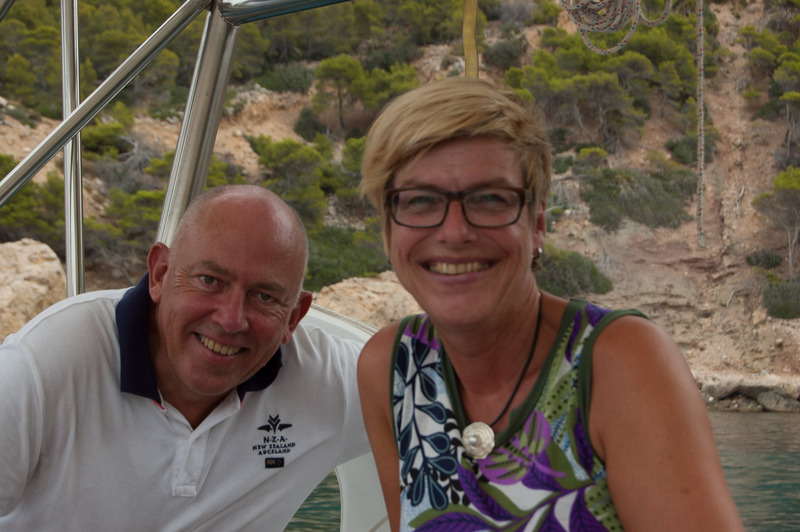 After quite a few hours of relaxation and enjoying being out on the Mediterranean, we eventually returned to Santa Ponsa, where Adriaan cracked open a bottle of cava and Sandra produced some accompanying nibbles to round off the trip. That – and the unexpected appearance of the early evening sunshine – made it a wonderful conclusion to our day out on ‘Simmertime’. We sat for quite some time, chatting, and listening to this couple of experienced sailors talking about their life on a boat. If you’re visiting Mallorca and fancy a day at sea – the perfect way to escape the heat on land and to see the island in a different way – make a date with Captain Cook. 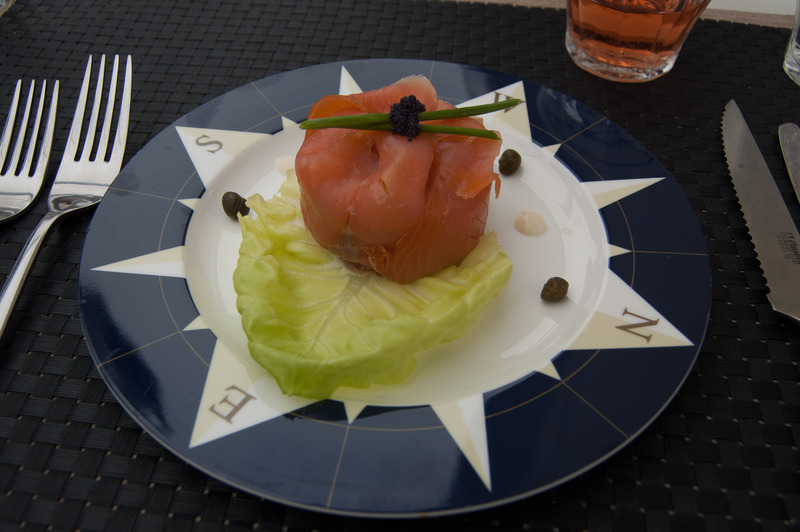 Captain Cook also offers a ‘Sun, Sail & Stay’ package, combining time at sea on their boat with a stay at Petit Hotel Son Arnau in the village of Selva, where you’ll also enjoy great food, prepared by the welcoming owners Susan and Alex Terry.